The River Prut, approximately 850 km long (550 miles), rises in the Carpathian Mountains in Western Ukraine. For most of its length, it serves as the border between Romania & Moldova (previously Bessarabia) until it finally flows into the River Danube at Reni, close to the Black Sea. For many people who have ancestors who once lived in Rǎducǎneni, the name "River Prut" brings back many memories of family tales and magical times. 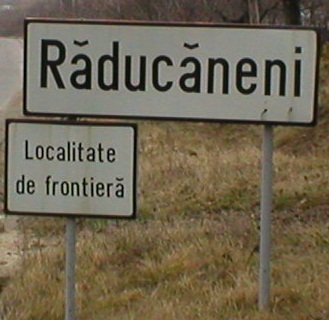 The highway sign posts, '' Localitate de frontier", at both the north and south ends of Rǎducǎneni confirm its border position. As the river was so close to the border and to the village, it became an escape route in both directions for people fleeing persecution. It also served as a crossing point for cattle and horse rustlers from Bessarabia. south of Rǎducǎneni, half way to Husi. is a tributary of the Prut River in Romania. is a tributary of the Bohotin River in Romania.